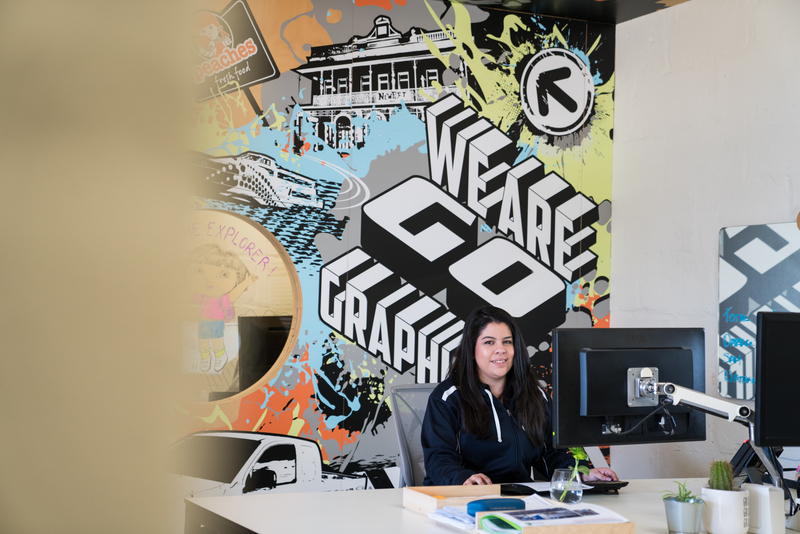 At Go Graphics, we value quality and workmanship, taking pride in all that we create. Using only premium-grade materials that are made to suit our WA climate, you can be confident that you are investing in the best signage for your business. We guarantee our products will perform as advertised, free from defects in materials and workmanship, with a limited warranty on most signage and vehicle graphics. Any damage to signage caused by vandalism, extreme weather / storms, accidents, abuse or misuse are not covered by this warranty. Go Graphics recommends that you read our care and maintenance advice, and add your signage to your business/property/vehicle insurance policy to cover any accidental damages. The warranty period begins at date of purchase, and if you do have a claim, it should be made within the specified warranty period. Please note that all claims are subject to approval by a Go Graphics authorised representative. Paint peeling from backgrounds, edges, lettering, framing, supports and all visible surfaces. Vinyl peeling, curling, shrinking or cracking. Substrate cracking, de-laminating or rotting. Breaking welds on metal framing, structures, and supports. Concrete footings of freestanding signs. Any concerns about the condition of your signage should be brought to the attention of the Go Graphics team as soon as possible so that we can address the situation appropriately and promptly. We only use premium-grade Avery Dennison vehicle wrapping films that we guarantee will perform as advertised and be free of defects with a limited warranty. This warranty applies to all vehicles including cars, vans, trucks, trailers, boats & motorcycles. Due to the nature of vehicle design and usage, the limited warranty period is for 6, 12 or 24 months – depending on the signage type. During this period Go Graphics will address any issues relating to defective materials or installation issues. Our Warranty does not cover incidental damage caused by pressure washing, mechanical washes, scratching, negligence or any other physical or chemical means. Our Vehicle Signage carries a 24 month limited warranty against vinyl peeling, curling, shrinking, cracking, and colours fading, on all vertical surfaces. This warranty is valid only where the vehicle’s painted surface is in sound, original and clean condition, and a regular cleaning regime is adhered to. Due to the increased exposure to UV and pollutants, horizontal surfaces such as bonnets, roofs and window sills, carry a 12 month limited warranty. Our one-way vision window films are 50% solid and 50% perforated materials, and therefore may limit the driver of the vehicle’s vision. Due to the fragile nature of the perforated materials, our one-way-vision window films carry a 6 month limited warranty. It can take up to 3 weeks for the glue to dry completely on these films, and for the pressure beneath the laminate to equalise, thus optimising clarity. Streaking in the media will be normal during this drying period. The warranty period begins at date of installation. All claims must be made within the specified warranty period and are subject to approval by Go Graphics authorised representative. Our Warranty does not cover incidental damage caused by pressure washing, mechanical washes, scratching, negligence or any other physical or chemical means. Your vehicle may be required at our premises for installation – Go Graphics will make every effort to ensure it is safe, and if kept overnight, it will be locked in our workshop. If a section of your wrap needs to be replaced at any time within the guaranteed period, or outside of the warranty period (at the customers cost), we will do everything we can to ensure that the replaced sections match the original design. However, some fading should be expected over time. This slight fading is hardly noticeable and is generally considered acceptable. Also, changes in printer and ink specifications could limit our ability to colour match the panels exactly. If your vehicle has had any after-market body repair (including dent removal, panel beating, re-spraying) please note that this will void all warrantees and guarantees. During the installation process, vinyl is often placed, removed and replaced more than once. It is possible for the adhesive backing to pull off the repaired paint or body work. Please be aware that Go Graphics will take no responsibility for damage that may occur during the installation process with after-market body repair and/or painting.